Massmart’s strategy is to be considered a leader by all stakeholders in our chosen markets and become sub-Saharan Africa’s most trusted retailer. Massmart‘s business model empowers our Divisions to take trading decisions suited to their individual operating needs, within a strategic operating and financial framework set by the Group. The framework guarantees consistent compliance with the best governance standards and national legislative requirements. It commits each Division to implementing Massmart’s core strategy of being a high-volume, low-margin distributor of quality branded consumer goods for cash, and ensures expansion plans add net value to the Group. Divisions are enabled to extract greater value from being part of a larger Group with greater access to goods and services or negotiating better terms and rebates with suppliers and service providers. The Divisions are differentiated as retail or wholesale formats that address different customer and market profiles. Decentralised decision-making is given effect through a Group Executive Committee reporting to the Group Chief Executive Officer (CEO). The Committee’s members comprise the CEOs of Massmart’s four operating Divisions and a Group Executive from each of Massmart Holdings, Channel and Shared Services. 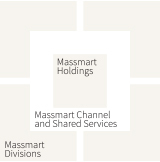 Massmart Holdings’ Executive Directors are also represented on each of the four Divisional boards as non-Executive directors. performs the Group management role and defines the strategic and broad operating principles that guide the Group’s activities. consists of formal trading and functional forums where ideas on collaboration across Divisions are shared. implements collaborative agreements reached by the Channel Forums. The most important are Group supplier negotiations for all products sold across the Group. report directly to the Chief Executive Officer and comprise Massdiscounters, Masswarehouse, Massbuild and Masscash. Working towards achieving everyday optimal performance. This is seen in logistics and business-to-business (B2B); stand-alone store formats; innovation and ecommerce; and our private label portfolio. We work towards nurturing talent and creating opportunities for our employees, customers, suppliers and business partners through learning and career development; our emerging talent programme; our nurturing talent campaign; and our Supplier Development Fund. Is what we, as Massmart employees, have committed to do in everything we do, every day, to earn the trust of our colleagues, employees, customers, suppliers and business partners. We aim to champion social and environmental leadership through energy efficiency; supplier advocacy; education initiatives; school nutrition programmes; developing suppliers; and employee health and wellness.